A final halt – For the fainthearted . . . Among the Christmas presents came a book with the capacity to revive vivid memories from early childhood days. “Branch Lines Around Chard and Yeovil from Taunton, Durston and Castle Cary” by Vic Mitchell and Keith Smith was published in 1999 and found in a Taunton bookshop during September. I remember my uncle’s white Bedford van being reversed towards all that then remained of the railway halt; the back doors were opened and flag stones from the platform were loaded into the back. It seemed like the end of a world. Taking the stones from the platform would mean that the trains would never run again; that something was gone forever from life and history. 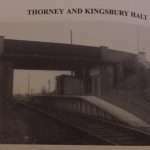 Asked now to find Thorney Halt, I would be hard-pressed to do so. Perhaps there are still signs that once one could reach the world from this hidden corner of rural England by taking a train to Taunton and from thence to London. Google Earth shows traces of the former track bed, but if one didn’t know that a railway had run through this place, would it be discernible as anything more than a farm track? 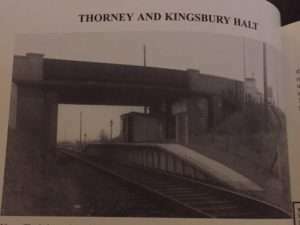 Thorney Halt still has the power to evoke a sense of uncertainty. Perhaps it derives from a childhood sense of mystery that the railway had been closed, that childhood questioning of everything, that need to ask why there was no longer a railway. Perhaps it is about a curiosity as to what had happened to the rest of the station, didn’t railways stations have all sorts of things, tracks, signals, signs? Where had everything else gone? Perhaps the uncertainty comes from a sense of memories being lost. Now the omnipresence of smartphones would ensure that no detail of the branch line or the stations would ever be lost, but in the mid-1960s, who would have thought such things worth the expense of photography? Perhaps no child looking back in fifty years time will feel such a sense of loss.